British entrepreneur, label & club owner, TV presenter & producer. Born: 20 February 1950 in Salford, Lancashire, England, UK. Died: 10 August 2007 in Withington, Manchester, England, UK (aged 57). 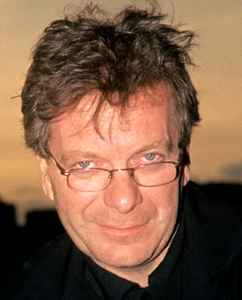 Tony Wilson was presenter of the late night music show "So It Goes", going on to start promoting his own club night in Manchester called "Factory", which led to him founding the Factory label, and later the legendary Manchester nightclub, The Hacienda. The labels Factory Too, Factory Records Limited, and F4 Records followed, and he was also the manager of artist The Durutti Column. Wilson was probably better known to those from the north of England as a Granada Television presenter, as he presented many TV arts programs for his local area television companies. Due to being forthright about his northern roots, he was often touted as a "professional Northerner", or dubbed "Mr Manchester". A semi-fictional film was made in 2002 about Wilson, the label Factory, and its bands, called "24 Hour Party People"; named after the Happy Mondays track "24 Hour Party People" (1987). Wilson was diagnosed with kidney cancer in late 2006. After having a kidney removed he responded well to initial treatment and spoke candidly of the good nursing he received courtesy of the British NHS in interviews during 2007. He also railed against the "postcode lottery" of treatment in the UK, with members of the Happy Mondays, and other acts he supported over the years, starting a fund to help pay for the drug "Sutent", which was not funded by the NHS in Manchester. At 7pm on Friday 10 August 2007 he died aged 57, following a third heart attack. His doctor stated that the attack was unrelated to the cancer, but that his general poor health helped contribute.